The schools Sensory Garden is an ongoing and developing project that has been evolving over several years. 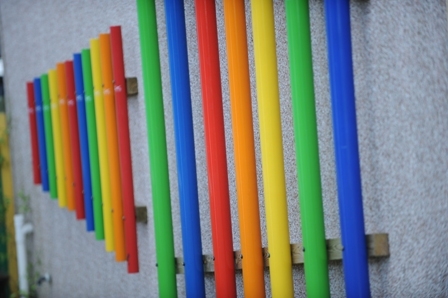 The garden has a dramatic water feature, musical wall and semi-circular benches for pupils to explore and experience. The plants and shrubs in the garden were chosen specifically because of their striking colours or because they were extremely tactile or very aromatic. Even in the depths of winter our large structural grasses and bamboos create focal points. A variety of different textured slabs, cobbles and tiles allows pupils who are non-ambulant to experience a different sensation as they are pushed over them in their wheelchairs. Although the garden was specifically designed for pupils with a sensory impairment, it is used throughout the day by the whole school community. It is a favoured place during breaks and lunch time and staff accompany either individual children or groups of children to the garden on a regular basis.